How to Figure Out How Old My Chihuahua Is? When you adopt a dog or puppy from the street, shelter or rescue, it is usually possible to only estimate the age. The teeth are the best sign of age in a dog. This is especially true with the Chihuahua, since it is small and has an adult-like appearance at a much earlier age than does a larger dog. Count your Chihuahua's teeth carefully in good light. Have an assistant hold the puppy if it's wiggly. Puppies have their full number of 28 deciduous teeth by the time they are about six weeks old. Deciduous teeth are tiny and very sharply pointed. Permanent teeth are much larger and a bit rounded. There are 42 permanent teeth. If you see 28 deciduous teeth, the puppy is eight weeks to 3.5 months old. If you see 42 permanent teeth, your Chihuahua is six to seven months old. Check if your Chihuahua has a mix of deciduous and permanent teeth. From four to five months of age, a puppy's permanent teeth begin to erupt, and the deciduous teeth begin to fall out. The permanent incisors are first to come in. These are the small teeth in the very front of the mouth. A Chihuahua with some of its permanent incisors in place is probably four to 4.5 months. If the incisors are all in place, the puppy may be five months old. 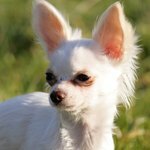 A Chihuahua that has some permanent canines, premolars and molars in varying stages of eruption is likely between five and 6.5 months of age. By seven months, all permanent teeth should be in place. Check the very back molars if the permanent teeth are all in. The molars will be very white and clean if the puppy is 12 months or younger. Between 12 and 24 months, the teeth begin to look duller and may have a little yellow tartar near the gum line. As the dog ages, there will be more tartar buildup on all of the teeth. If you see a lot of tartar and some wear, your Chihuahua may be between three and five years old. Between five and 10 years old, most dogs' teeth show wearing, heavy tartar and possibly signs of disease. Old dogs -- 10 to 15 years and older -- have heavy tartar, heavy wear and signs of disease. Some teeth may be broken or missing. Look at your Chihuahua's overall appearance for more clues to its age. Puppies look like puppies, although this may be harder to see in Chihuahuas than in other breeds. Puppies tend to look babyish, not just smaller. They may look awkward, with a head that seems big for the body or legs that seem long for the body. The coats of puppies up to around seven months of age are usually softer and there seems to be no shedding. Consider the activity level, behavior and experience level of your Chihuahua. Puppies are usually more active, but Chihuahuas can be very playful well into their adult years. However, puppies tend to have a harder time calming down when playing and do not seem to have life experience. For example, a puppy may be fascinated by a mirror while an adult has already learned about mirrors. Take your Chihuahua to the veterinarian for a complete examination. The veterinarian can usually give you a more accurate guess of your dog's age.